Nurfarhana Hizan Binti Hijas & Kaviarasu Munian (2018, March). Hylarana erythraea (Schlegel, 1837). Malaysia Biodiversity Information System (MyBIS). Retrieved April 22, 2019, from https://www.mybis.gov.my/art/207. Hylarana erythraea or Green Paddy Frog is a common true frog in the family Ranidae. It is also known as Red-eared Greenback because of the colour of its tympanum. In Malaysia, locals call this frog Katak sawah hijau. This widely distributed frog can be found in large natural water bodies, artificial ponds (Lim et al., 2010) and disturbed areas (Shahrudin et al., 2011). It is distributed throughout South-East Asia including Borneo, Peninsular Malaysia, Singapore, Indonesia, Thailand, the Philippines, Vietnam, Laos, Cambodia, and Myanmar. The Green Paddy Frog is a beautiful frog, and the adult male is able to grow to a maximum size of 45 mm while the female up to 75 mm (Brown & Alcala, 1970). 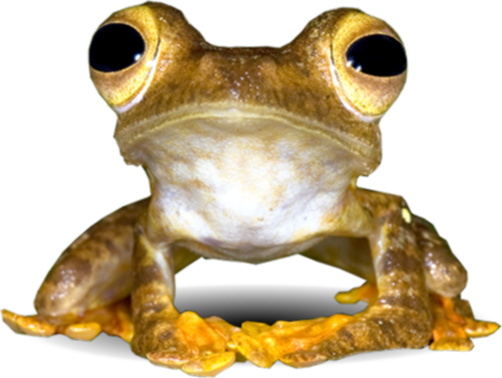 This frog is easily identified by the pair of white bands running from behind the eye, along each side of the body to the rump. There is a red tympanum located on the left side of its eye, usually measuring about one-third the diameter of the eye. The top of its head, back and sides is a bright to dark green colour. The upper lip is white and joins a white stripe running over the armpit and along the lower part of the body. The upper surfaces of its limbs are light brown with fine dark markings while its underside is pearly white, occasionally with slight dark mottling towards the outer edges (Inger & Stuebing, 2005). Like other frogs, H. erythraea's diet consists of small terrestrial invertebrates such as small millipedes, crickets, and ants. This species plays an important role as an indicator of habitat disturbance in Malaysia as it is mostly found in disturbed habitats created by humans, including flooded paddy fields, plantations, and irrigation ditches. Based on the IUCN SSC Amphibian Specialist Group (2014), this frog is categorized as least concerned (LC) since it only faces minor threats such as water pollution, and over-harvesting. Sometimes it is found in the international pet trade but that only impacts some populations. However, in Malaysia, they are protected under the Malaysian Wildlife Protection Act 2010. Citation:- Nurfarhana Hizan Binti Hijas & Kaviarasu Munian (2018, March). Hylarana erythraea (Schlegel, 1837). Malaysia Biodiversity Information System (MyBIS). Retrieved April 22, 2019, from https://www.mybis.gov.my/art/207.